Race 2 in the BBQ series this Sunday – the Fastnet, starting at 14:30. There were 19 starters and the race lasted only about a lap and half due to Mike’s giant slalom course. In the lead at the end of the only completed lap were Newton & Ellen (RS200) followed by Sylvia (Laser), Dave & Ann (Leader), Hugh (Laser – already back from Uni for the Summer) then his old man Curtis (Radial) and Ralph (Laser). At the finish gun Newton & Ellen still led with Sylvia 2nd, but Richard S (Laser) had moved up to 3rd with Hugh still 4th. Karen (Laser) was now 5th with Dave & Ann down to 6th. The other movers up the order were James (Laser) up to 8th and Gareth (Laser) up to 11th. Chris A (Solo) retired as his boat was making water after a collision with another boat, let’s hope the damage is not too bad. Julian B and family out in a Mirror were going well and still led approaching the end of the first lap, but then went straight on at 5 instead of coming down to 8. They realised the mistake and turned but then found themselves coming into 8 on port with a stream of boats coming down on starboard with no way through them, so they also decided to retire and enjoy a leisurely sail. There were 16 starters for the second race, with the loss of the Mirror, Radial and Solo, and Karen got a cracking start, but the boats crossing the line last were unfortunate as the wind died right away and they could only wallow on the line watching the rest of the fleet stream down the lake. Karen led by a long way at the end of the first lap with Sylvia coming through in 2nd place a minute and a half behind her. Richard S was 3rd just ahead of Peter R who was going well single handed in his Enterprise. The next bunch of boats were very close to one another and led by Ralph (Laser) followed by Hugh, then Ellen & Newton (who had done well to make up ground after being one of the late becalmed starters). Virtually crossing the line at the same time were James, Dave & Ann, Gareth, Dean & Nick (Vago), Alistair S (Laser) and Adrian (single handed Vago). Bringing up the rear were Chris H (Comet), Hadey (4.7 – not usually this far back) and Rick (Laser – having trouble with his tiller). Chris H retired at the end of this lap. By the end of the second lap Richard S had moved up to 2nd and Ellen & Newton were up to 3rd. James had moved up two places to 5th and Dave & Ann had gained two places to move up to 7th and Rick and Hadey both gained a place. Everyone else either maintained station or lost ground (or should that be lost water, although in my experience most boats gain water during the course of the race especially old wooden ones! At the end of the third and last lap the leading four boats crossed the line in the same order with Karen still well ahead. Peter R had regained two places to move up to 5th and Ralph made up three places to move to 6th. Further down the fleet Alistair S, Hadey and Adrian all gained a place. On handicap the first three should retain their positions, but Peter should move up to 4th with Dave & Ann up to 5th and Hadey up to 6th. Considering their good performance it was a little ungallant of Dave to dump Ann in the water when they came into the jetty ! Thanks to Mike A and the OOD Team of David F, John H and Brian M.
Well after a long dry spell, the monsoon season had arrived ! It had been raining all day and continued to do so through the evening. There was no SOOD so Carol M, Clare D and Ann D volunteered to run the race with a little help from some of the racers, especially those who did not fancy venturing out in a light wind and steady rain ! The wind was roughly NW about 7 mph, although it varied in strength and direction and the course was 6p, 9s, 5s and Orange p (just out and to the left of the smaller slip). The OOD Team decided to use the mast on the decking as one end of the start line, which was a wise decision in the unremitting downpour as at least they had some shelter. In the light wind the race was a one lap affair and there were only six starters. Karen (Laser) led at the first mark followed by Mike A (Lightning) and Newton (Solo). Slightly further back were Nick & Dean (Vago) ahead of Jeremy T (Laser) and Jemima (Oppie). By the second mark Mike was just ahead of Newton with Karen further back, but Nick and Dean were gaining fast. Newton passed Mike on the way down to the Orange buoy and crossed the line in first place. 1st Newton; 2nd Mike A 3rd Nick & Dean; 4th Karen. Jeremy would have been 5th and Jemima 6th, but the wind died away and Jemima was rescued by brother Edward who was out in a canoe (probably the fastest craft on the water!) Jeremy appeared to make the finish line, but was listed as a DNF, so perhaps he gave up hope of ever actually crossing the line ! On handicap Mike will probably just pip Newton, but the other positions should remain unchanged. Thanks to the OOD Team of Ann, Clare and Carol and to those who provided assistance. 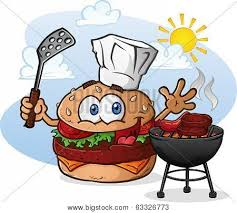 A reminder that the BBQ series starts this Sunday at 14:30. The format will be as before, fun informal racing for youth and juniors (but big kids are welcome as well), but around a theme of a famous sailing race. 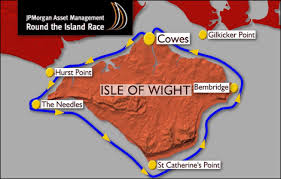 The first in the series will be the “Round the Island”. As less challenging course will be set for any Oppies not brave enough for a circumnavigation (so Hurst point and back !). Not sure that the weather will necessarily play along, but if it does why not make an afternoon of it and bring along your own BBQ ? With a WSW wind of about 12 mph, John W was able to use the usual flagpole start line with a first beat to 4, then 1s, 3s, 8p, 6s, 7s and back through the start line. There were 17 starters and everyone completed the race, which lasted about two laps before the finish gun sounded. First away was Rhys in his Topper followed by Chris H (Comet|) and then the 4.7s of his brother William and Hadey. As usual Dave I, who sailed with a Radial rig in the first race, did not take part in the handicap race and this left 16 starters for the second race, which consisted of three laps. Fist back through the line at the end of the first lap was Julian B (OK) not far ahead of Ellen & Newton (RS200) followed by the Lasers of Rick and James, who crossed the line together, and then close behind them were Mark and Karen in Lasers, who were also very close as they crossed the line. Richard S (Laser) was next through in 7th place, just ahead of the Radials of Ralph and Mike A. Then there was a gap back to another close group headed by Hadey (4.7), Dean & Nick (Vago), William (4.7), Alistair S (Laser) and Chris H (Comet) and another gap back to Adrian (Vago – single handed) with Rhys gamely bringing up the rear in his Topper. Dean & Nick and Alistair retired after completing the first lap. By the end of the second lap the first two boats had maintained their lead, but James had established himself in 3rd place with Mark moving up to 4th. Karen, Richard S, Ralph and Mike A had all moved up one place to occupy 5th, 6th, 7th and 8th positions, whilst Rick had taken penalty turns after touching a mark twice. Rhys received the finish gun at the end of this lap. At the gun there was no change in the places of the leading two boats, although Julian had stretched his lead slightly. Mark had managed to get past James to take 3rd place and Richard S had moved up one place to 5th and Rick had regained a place to move up to 8th. On handicap the first four should maintain their positions, but Ralph should move up to 5th pushing Richard down to 6th. Thanks to John W and the OOD Team of Cecilia, Patrick, Gareth and Al. The wind was 8- 10 mph, but coming from an awkward direction E to ESE, so Chris A used a Committee Boat start with X as the first mark (opposite the flagpole but in the middle of the lake), then back up to 5, 9, 2, 3, 4 and back through the start. There were 20 starters and first back through the line was Karen (Laser) who led for all three laps of the race and steadily pulled away from Newton (Solo) who in turn was well ahead of Mark (Laser) and these three maintained their positions for the whole of the race. On the first lap Monica (Europe) came through close behind Mark with Rick (Laser) further back in 5th place with Sylvia & Peter (RS200) in 6th. Then came the three Lasers of Richard H, Mike T and John H with Paula in close company in her Radial. Behind Paula, Paul H (Supernova) was leading a close group consisting of Dean & Nick (Vago), Chris S (Laser – in his first outing of the year)), Jeremy T (Laser), Will S (Enterprise – good to see another Ent on the lake), Sally & Mike C (Leader – yet another new crew for Sally!) and Ben H (Topper), then slightly further back were the Oppies of Jemima and Edward sandwiching Robin L in his Comet Duo. On the second lap the only movers were Sally & Mike up four places to 12th, Will up two places to 13th and Robin up one place. At the end of this lap Monica came in to retire from her 5th place for an early G & T ! At the end of the third and last lap the first five boats had maintained station, but John H was up three places to 6th with Richard H and Mike T still 7th and 8th. Sally & Mike had gained another three places to move to 9th and Will was up another place to 12th and Chris S had regained two places to 13th. On handicap Karen and Newton should keep their 1st and 2nd places, but Edward could move up to 3rd with Jemima 4th with Mark down to 5th and Sylvia & Peter down to 6th. Thanks to Chris A and the OOD Team of Mike A, Ann, Claire, Helene and Graham. There was quite a frisky wind tonight about 12 mph from NNE. Chris H set the first beat to X (in the middle of the lake level with the normal start flagpole) then 5p, 8s, 9s, 3p, 2p and back through the start. There were 14 starters including Jemima and Edward in Oppies and Joe in his Topper. First back through the start line was Mark (Laser) followed by Karen (Laser), Jon (Laser) then Newton in his Solo. Sally & Stuart (Leader) were going well in 5th place with Ralph (Radial) 6th and Dean & Nick 7th in the Vago, closely followed by Mike A (Lightning) and Chris A (Solo). Then there was a gap back to Dave & Ann (Leader) with another gap back to Joe (Topper) who was just ahead of Chris & Carol (Sport 14) with Edward and Jemima close together at the back of the fleet. At the end of the second lap there was no change in the first four, but Ralph had passed Sally & Stuart to move up to 5th and Mike had passed Dean & Nick to move to 7th. Chris & Carol had gained a place by getting past Joe, and Jemima was just ahead of Edward as they crossed the line together. On the third lap Jon and Newton both got past Karen to move up to 2nd and 3rd, but there were no other changes in position apart from Edward who had pulled slightly ahead of Jemima and they received the finish gun along with Joe and Chris & Carol at the end of the lap. The fourth lap was the last and Jon just managed to cross the line ahead of Mark to take the victory. Karen repassed Newton to take 3rd spot and Dean & Nick had repassed Mike. 1st Jon; 2nd Mark; 3rd Karen; 4th Newton; 5th Ralph; 6th Sally & Stuart. On handicap Newton will move to 2nd and Sally & Stuart leapfrog Ralph to 5th. Edward will win the battle of the juniors. Thanks to Chris and the OOD Team of Bob, Roland and Rick.